A set of old small-block Chevy valve covers with TRACO decals. These came in the spares box that also contained the TRACO stamped and tig-welded water pump pulley that I posted images of earlier. Note that a cover with no provisions for oil fill or venting was used. Does anyone know the original application(s) and GM part number for these valve covers without a provision for a breather or oil fill tube? Chad, Those are some interesting covers. I haven't seen Traco do chrome before. I'm not really sure of what application might have been original for valve covers such as those but maybe someone else will have an idea. They look like the Chevrolet script valve covers but without the script or like the '68 Z valve covers without the holes. I have noticed that some of the reproduction part vendors have a valve cover like this. I wondered why they did it because I couldn't think of what it might have been original for. Hopefully this mystery will get solved. I think the Can-Am and Formula 5000 crowd could help on this. 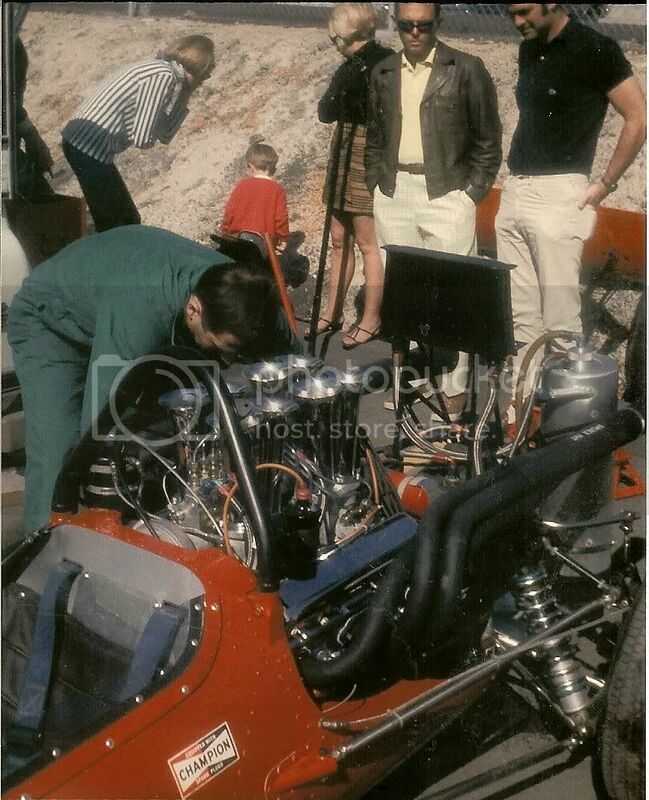 Here's a shot of similar no-hole, no script or decal indent chrome valve covers on a McLaren M10 Formula 5000 car with a Ryan Falconer modified injection set up. And though not chrome, Ryan Falconer's pretty much default small block valve cover also appears to be a similar stamped steel part. Good info, Chad. Classic Industries offers a reproduction of these, seen here. Part number C482. The only difference I see is the two clips attached to one of the valve covers. I swear I saw them offered as unpainted also, but I didn't see those on their website when I looked earlier today. Maybe somebody else offers them. Thanks, Jon. I appreciate the link and note. Though I don't need a set currently, you never know when you would... and if these will still be available. I'm like you though, and would prefer to find them bare, or at least without chrome. I'll also follow up with what my Formula 5000 and Can-Am buddies have to say. I doubt the "reproduction" valve covers are even close to the chrome Traco covers. Aftermarket covers I have seen are symmetrical if you view them from the end. If you notice the first picture of the chrome Traco covers you may be able to notice the difference I'm talking about.The top side is closer to a 90 degree than that of the lower side. Thus if you were to install them wrong (Traco decal upside down) the rockers may actually hit the inside of the cover. So if you were to install the previously mentioned "Chevrolet" script covers with the lettering upside down the rockers would hit the covers. The profile view is also different on the cast aluminum 69+ 302/LT1 valve covers. Thanks Robert, I appreciate the feedback and potential issues. I've not seen or used a reproduction valve cover. I remember seeing a few pair of these on Chevy Camaro TV's picture section about a year ago. They may have had them for sale. 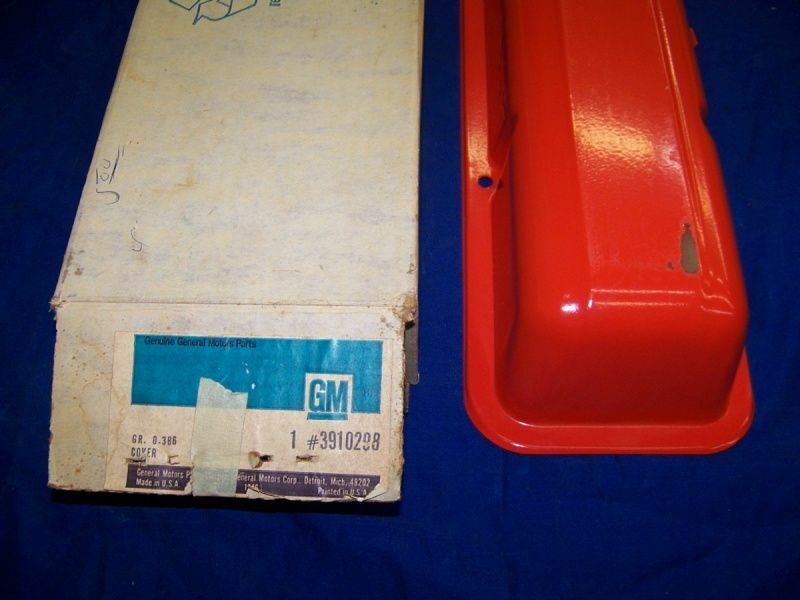 It's taken a bit longer than I would have expected to follow up on this thread, but it would appear that at least one original GM application has been found for a stamped steel, no hole, no tab and no "Chevrolet" script valve cover. A valve cover like the above TRACO items (though not chrome), or Ryan Falconer piece. 1967 GMC truck with a 327 engine. No "Chevrolet" script because they're not a Chevy. No holes because it breathes from a fitting on the back of the block to the base of the stock carb. There is also a canister in the lifter valley under the intake that connects to the fitting on the back of the block. No oil fill provision, because that's still done by an oil fill tube on the front of the intake. I joined a '67-72 Chevy/GMC truck forum to ask a bit more, and folks have provided pictures of their well-worn but stock engine compartments with these valve covers. One fellow noted that his left and right valve covers do not have spot welded tabs for retaining wires either. I don't have a part number yet, but perhaps someone will follow up with that shortly. Though several could source and modify a variety of other stamped steel bits that could easily reproduce this look, I was only interested in finding out what may have originally been used back in the day. Great detective work, Chad. Thanks for continuing to follow up on this subject. I suspect that the valve cover usage was '67 and earlier GMC V8s, not just limited to the year 1967 itself. Mr. "Sixteen Grand Sedan #56" pointed out an ebay auction to me for an NOS painted version of these valve covers. The great part is it has a part number for us to reference. As Mr. "Sixteen Grand Sedan #56" and I discussed elsewhere today, I used the same auction and those pictures in my discussions with some other racing folks I've communicated with about a potential match for the thread starting TRACO stickered valve covers above. 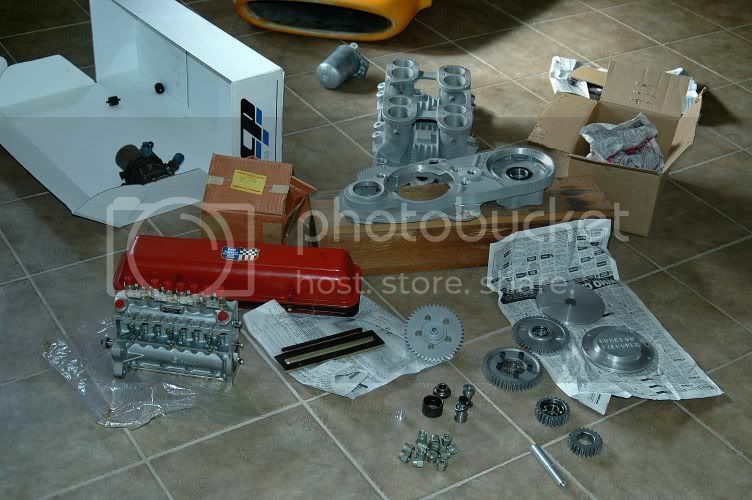 Additionally, I turned one of those racing friends on to these items, found because of the same part number reference. However, I've yet to mention part numbers on this forum, because it's not completely clear which number references a cover with and without tabs. 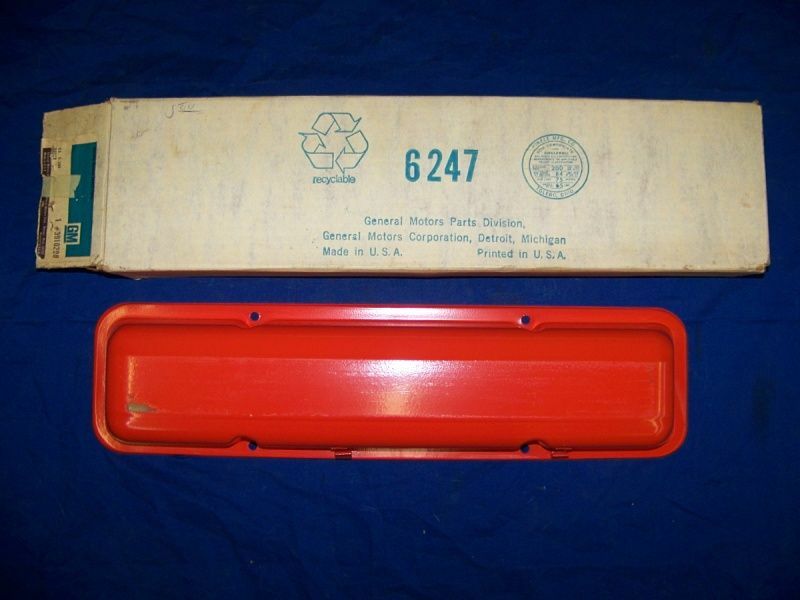 Additionally, there are several references to this part number, including the GM parts book references, that would lead one to a cover with different features. Mr. "Sixteen Grand Sedan #56" looked into this more in depth today, and perhaps he's found something a bit more conclusive. And the folks with original '67 GMC trucks with these covers, without tabs (probably the passenger side cover), may also be of help soon. I will continue with the effort, and hope to provide something a bit more concrete.